With just a few tweaks, "Stop!! Hibari-kun!" could've stood the test of time. ... or maybe at its core, it isn't just a few tweaks, but the skeleton of "Stop!! Hibari-kun!" itself that is the problem. this is an issue that I find as a casual reader to be conflicted about. The manga doesn't stand the test of time, but is not simply a relic of its era... and maybe that's the most disappointing part. That may come off as rude, but when there are so many small good moments sprinkled across and throughout the manga, it becomes frustrating when the biggest problem of the whole endeavor lies directly in front of the reader. The art is fantastic, knows when to go big and strong, and when to pull it back and go light and cartoon-y. The premise of the manga itself isn't too bad, and most of the characters, at their core, are interesting and enjoyable. Unfortunately the manga has a few too many cultural hang-ups for the time of its inception, primarily when it comes to handling the themes of sexuality. The dynamic of Hibari as a trans woman in the early 80's, comes down to her simply being a gag in-and-of-herself. Almost nothing more. She is dealt some sympathy from the author at hand, but not enough to by treated with any sincerity, by those who know of her as a transgender woman for her time, those being her family and occasional characters. She is herself a great strong character, but is confined to the frames of a "great for its time" gag-manga, that just barely gives her enough footing to stand out as anything more than a dated "man-in-drag" gag. On occasion she does almost break loose of that, but more when it comes down to the amazing artwork between chapters, not in the story of the manga. I do not believe that this was done in some intentionally malicious way, but that this was simply the norm of handling a character, such a Hibari, at the time. The consequence of this years later, is that the manga nowadays' leaves a bad aftertaste hanging, like a noticeable stain on a white t-shirt that you really loved wearing. 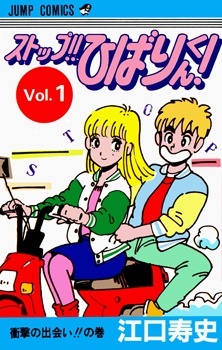 I do not regret having read and finished the manga, but simply giving it a 6 as a score, and then moving on, in this case, leaves me feeling incomplete when it comes to how I feel about "Stop!! Hibari-kun!". Far better than a lot of other manga i've read, tho. I'll at least give you that. It is still absolutely worth a read just for the art and characters.